The program opens with the easy-going “A Walk In The Park” and quickly shifts into Chinese-inflected pieces that manage to retain much of the chromaticism of Western music. The moods of the trio of “Mist” pieces segue neatly into each other as the concept of a far distant “day” begins to break. The remaining five tracks of this program maintain the previously established sense of peace and tranquility that may reside in a distant part of the world that, unfortunately, many of us may never actually get to visit. As I mentioned in my earlier review of Fiona Joy’s music for Signature-Solo, there are obvious echoes of New Age piano master George Winston and British composer Michael Nyman, but she clearly has her own voice and understandably declines to be categorized as a “New Age” artist. I prefer to think of Fiona Joy’s music as contemporary, in the sense that music being composed today will reflect and touch upon the spirit of our times, much as did the keyboard masters of the Baroque, Classical, Romantic, and Modernist eras. At times, listeners will appreciate a touch of minimalism in the repeated chord progressions that give way to new musical ideas, not really a new concept either as composer Franz Schubert often used it. The piano remains one of the most challenging instruments to record both live and in the studio. Delivering the so-called audio “goods” requires not only great microphone placement but also the ability to capture the piano’s timing so that everything gets to your ears as intended. Cookie Marenco has developed the proprietary Extended Sound Environment (E.S.E) technology that, along with recording in native DSD formats, avoids the potential sonic pitfalls of pulse code modulation (PCM). In the case of this album, all recording was done in the DSD256 domain to yield this superb-sounding SACD. As importantly, the tracks on this session were laid down in single takes, a relative rarity in recording studios today, and an approach that enhances the freshness and spontaneity of the program. The piano played in this program is a legendary 7’ Steinway grand 1885 edition, perhaps the high-water mark of this brand’s manufacturing history. This recording brings out the warmth and dynamics of a great instrument like you may never have heard before and puts everything smack dab in the middle of your listening room! I rarely dole out superlatives in my reviews but this recording pushes my PRaT (Pace, Rhythm, and Timing) meters to the top in all respects. A brief program booklet is included that lists tracks and performance and production credits. As a music lover first and audiophile second, I love it when there is the perfect union between both worlds such as the one that Blue Coast Records has accomplished with Into the Mist. 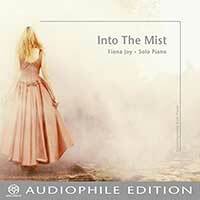 For those who are unfamiliar with the artistry and ingenuity of Fiona Joy, this SACD is a great way to become acquainted. This SACD will make its debut at the Los Angeles Audio Show on June 2, 2o17. Highest recommendation. Another superb recital by contemporary Australian pianist Fiona Joy that will delight her old and new fans.